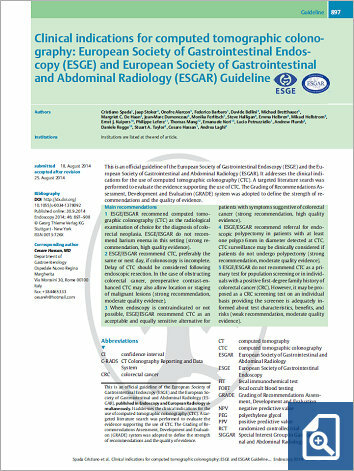 1 ESGE/ESGAR recommend computed tomographic colonography (CTC) as the radiological examination of choice for the diagnosis of colorectal neoplasia. ESGE/ESGAR do not recommend barium enema in this setting (strong recommendation, high quality evidence). 2 ESGE/ESGAR recommend CTC, preferably the same or next day, if colonoscopy is incomplete. Delay of CTC should be considered following endoscopic resection. In the case of obstructing colorectal cancer, preoperative contrast-enhanced CTC may also allow location or staging of malignant lesions (strong recommendation, moderate quality evidence). 3 When endoscopy is contraindicated or not possible, ESGE/ESGAR recommend CTC as an acceptable and equally sensitive alternative for patients with symptoms suggestive of colorectal cancer (strong recommendation, high quality evidence). 4 ESGE/ESGAR recommend referral for endoscopic polypectomy in patients with at least one polyp≥6mm in diameter detected at CTC. CTC surveillance may be clinically considered if patients do not undergo polypectomy (strong recommendation, moderate quality evidence). 5 ESGE/ESGAR do not recommend CTC as a primary test for population screening or in individuals with a positive first-degree family history of colorectal cancer (CRC). However, it may be proposed as a CRC screening test on an individual basis providing the screenee is adequately informed about test characteristics, benefits, and risks (weak recommendation, moderate quality evidence). ESGE and UEG have identified quality of endoscopy as a major priority. This paper explains the rationale behind the ESGE Quality Improvement Initiative and describes the processes that were followed. We recommend that all units develop mechanisms for audit and feedback of endoscopist and service performance using the ESGE performance measures that will be published in future issues of this journal over the next year. We urge all endoscopists and endoscopy services to prioritize quality and to ensure that these performance measures are implemented and monitored at a local level, so that we can provide the highest possible care for our patients.